In case you do not have an appropriate training space, SimpleJohn offers to deliver a multifunctional cabin in the form of a hall office, suitably equipped for conducting the e-learning lectures. This will allow you to realize this training in the workplace. 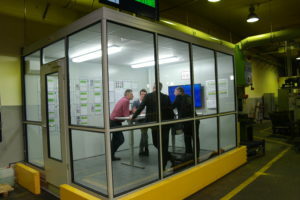 This is a soundproof glass booth directly placed in production. Due to its modular construction, the cabin may be used as an office, conference room, measuring cell, control station, break or social room, sanitary facility, etc. In addition, in case you would like to move or relocate the training center, it is possible to provide a mobile cabin. 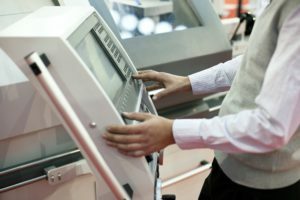 For the workers to be able to carry out the online trainings in the cabin, SimpleJohn ensures that the training center has appropriate equipment. At the same time, we can equip the training cabin according to your wishes and needs so that it can also be used for other purposes. In each cabin we also recommend placing a computer desk, magnetic bulletin board, or interactive whiteboard. In case of your interest SimpleJohn can arrange a submission and processing of an application for the co-financing of the training centers from the EU funds. Small and medium-sized enterprises are able to obtain financial support for the construction, acquisition or renovation of existing training centers, procurement of equipment training premises, including equipment, training programs and intellectual property rights. Do you see a potential for the use of the multifunctional training cabins in your company? Feel free to contact us!